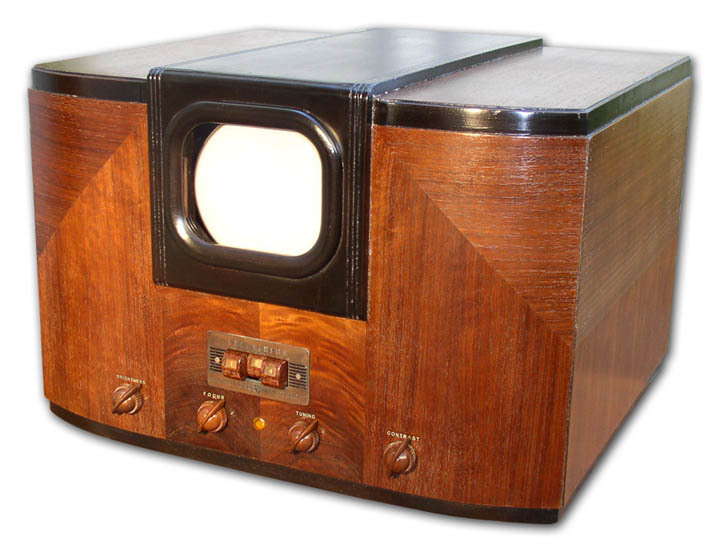 GE HM-171 early prewar 1939 TV. Working, restored. 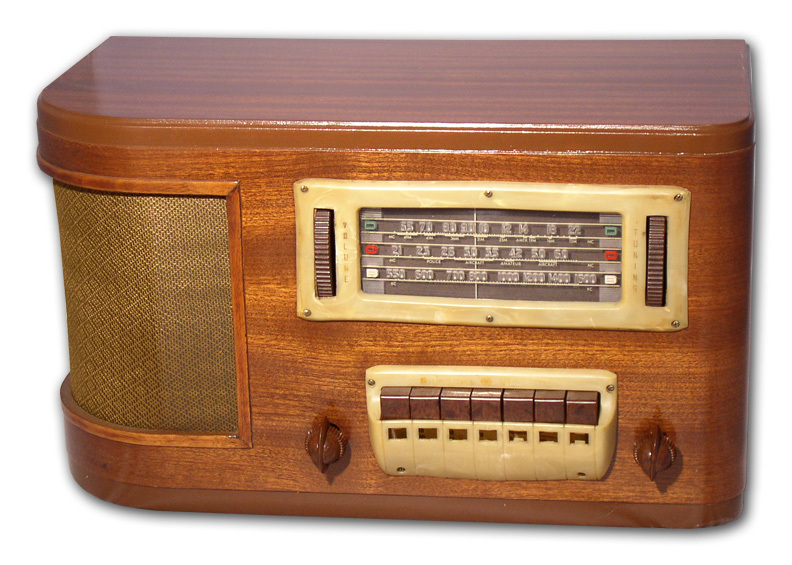 This sensational table model Picture Receiver with Sound Converter makes it possible for the miracle of television to be enjoyed in homes where this model is used in conjuction with a radio receiver. You get sight reception from the Picture Receiver. You hear the sound portion of the television broadcast through the radio's loudspeaker. Picture size is 3.25 x 4.25 inches of Black & White video of highest definition receiving 3-stations. Wow! View video image (please excuse the glare, a hard to photograph image). Beautiful "art deco" cabinet is styled along simple modern lines, with the spirited beauty of walnut veneers. The front and side panels of stripe American Walnut with grain miter-matched on the front face. Picture escutcheon of solid wood, finished in dark brown, rolls gracefully over the cabinet top. Highly center-matched American Walnut is mirrored on the control panel. Brown plastic "art deco" knobs and bakelite push-buttons finish this smart design. Total size is 14 H x 20 W x 18 D inches. Registered with the early Television museum as rare #17 surviving. 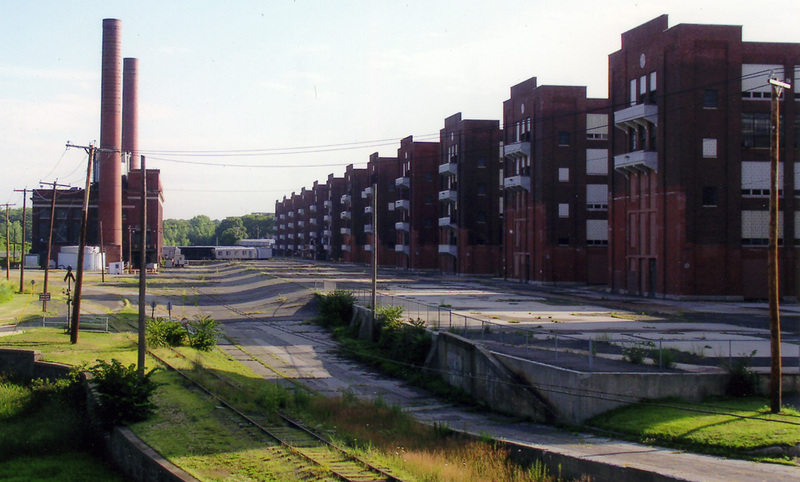 To begin with, I live just a few miles from the original GE plant in Bridgeport, CT. The building itself has quite a long history onto itself. 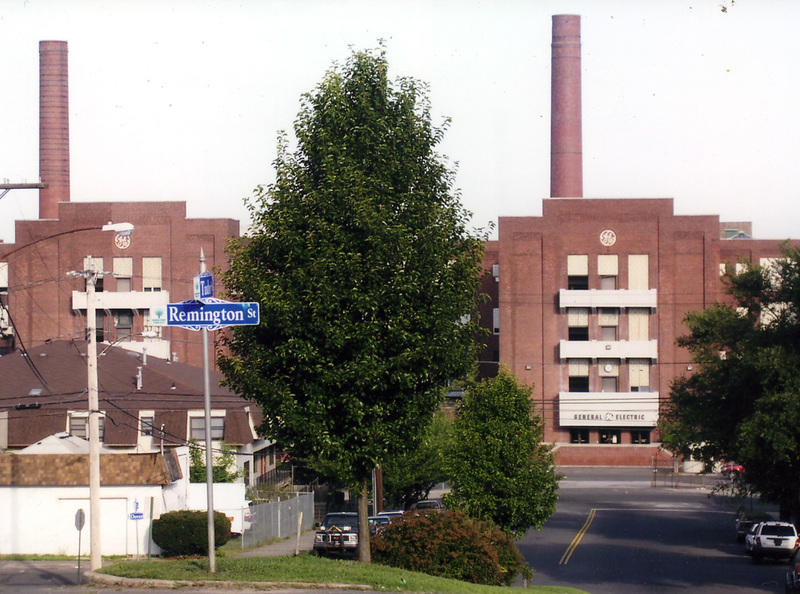 Originally built by the Remington Arms Company (supplying arms & ammunition for WWI), this 1915 building is over a half-mile long on 50 acres and once housed 22,000 employees. 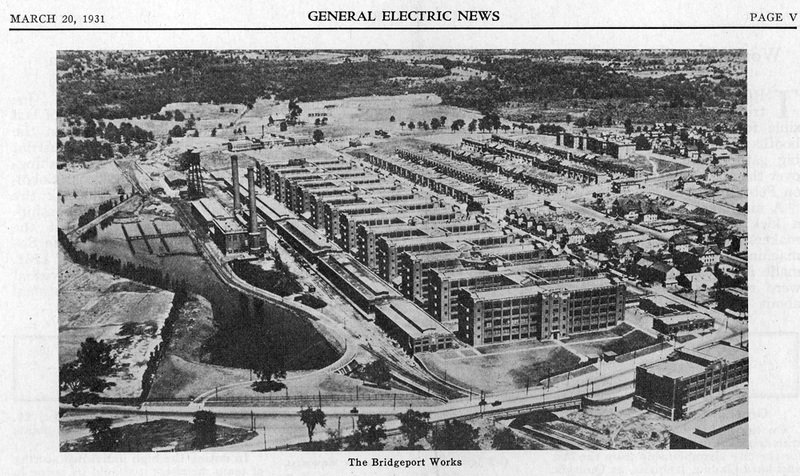 View GE in 1931, view today (front), view today (rear). 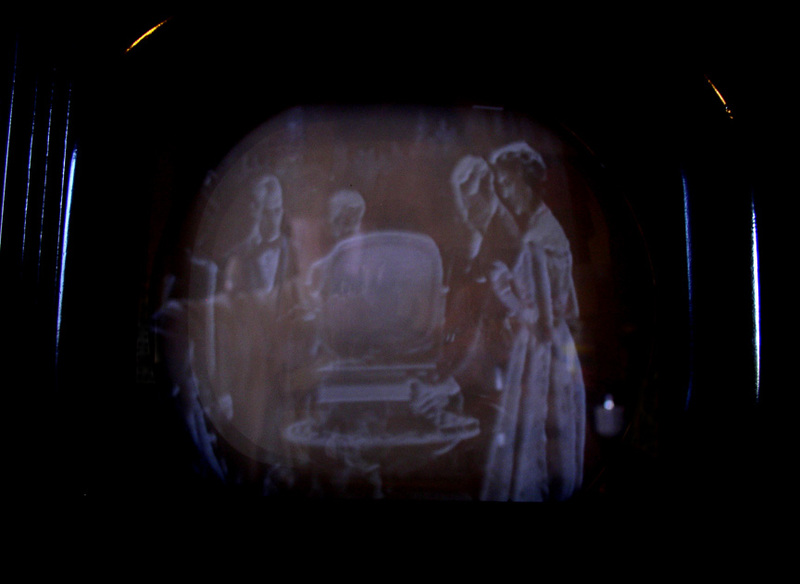 Sometime after WWI, GE purchased the building for manufacturing which included many consumer products such as this very first television. As you could imagine, GE employed many people over time, some who started their own Radio & TV repair businesses right here in Southwestern CT. As you know, almost all the old time repair shops are gone and I have been very fortunate to find the last remains of some of this buried treasure. This is how I acquired the HM-171. The found condition was awful (view the cabinet before & after pictures, view the chassis before & after pictures) and in various parts scattered all over the basement but the completeness turned out to be about 98%. Inside the HM171 is an original (as found) 5BP4. I have a second on (purchased as good-surplus) that turned out a bit less in brightness than this one and several bright 5BP1's (oscilloscope green) used to bring it up. 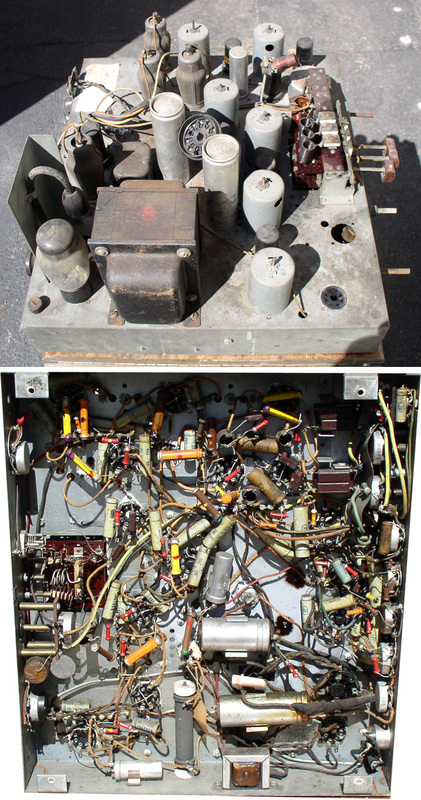 I cannot believe that I found all of the components except for (best I can tell) the CRT front collar, the CRT rear bracket (I recreated this part by modifying one from an old oscilloscope), and the rear cabinet cover with AC cord. Also, some common tubes were missing and replaced with New Old Stock (6N7, 6F8, 5U4, etc.). Note, there is more that can be done to the chassis (2-high voltage caps were left original which I have replacements) and further cleaning & detailing but I will leave that up to the new owner. To get the chassis alive, all the paper-wax and electrolytic capacitors plus a few resistors were replaced. Channel pushbuttons labeled 1, 2, & 4, actually bring in 2, 4, & 5. With a video source (DVD player) and RF modulator into channel 4, a picture was displayed. There is just enough range on the controls to get this 441 line system to work a 525 line source. The AM sound was not tried but can be accomplished at the time of purchase. 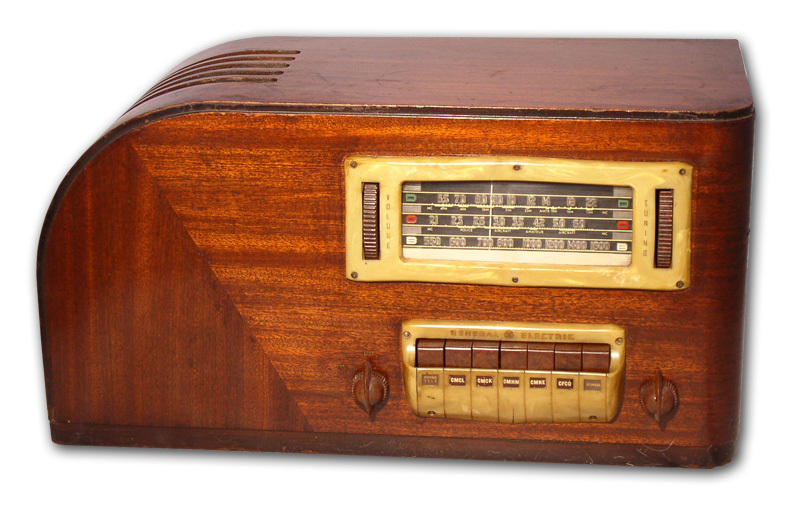 For audio, I even have 2 versions of the complimentary 1939 GE radios to offer (H634 & H640)! Finally, the cabinet. The base was in pieces and had to be reconstructed and reattached to the rest of the cabinet. It is solid now. The refinishing process was almost as lenghty as the electronic restoration. The old alligatored / damaged lacquer finish had to be removed carefullly by hand rubbing without damage to the beautiful wood veneer. Once removed, proper toned lacquer was sprayed to accomplish the two-toned original factory color. Front lettering was applied and then a final satin top coat was used. I then hand-rubbed a final protective coat of paste wax to smooth out the finish. GE radios (as mentioned before), original GE Service Data, original Radio & Television Retailing magazine from April 1939 (GE ad plus other TV introductions at the 1939 New York World's Fair), original Communications magazine from April 1939 (TV introductions), plus many spare NOS tubes & parts. My asking price is realized from the 2005 Radio & Television price guide (Kyle Husfloen, Steve McVoy, Harry Poster, & Bob Ready) plus the amount of parts & labor that went into the whole restoration process. A Zenith Stratsophere Model 1000Z (40 know surviving) fetched an eBay price of $50,000 (January 2005) unrestored! 512 Stradivarius violins exist today and can fetch millions of dollars if one became available. I am sure there are many other examples (please let me know if you know of one) and thank you for your interest.